For the third consecutive year, IMAN mobilized dozens of organizers and leaders at the Georgia State Capitol for Justice Day. Throughout the day, IMAN leaders and Green ReEntry cohort members shared their firsthand experiences navigating the criminal justice system. Their narratives—and those of their mothers, children and other family members—highlighting incarceration’s layered impacts spurred deep interest from local legislators. We also joined our partners at New Georgia Project, which works to increase voter turnout and protect voting rights, and RestoreHER—an organization fighting to protect the dignity of incarcerated women and support their transitions back home—at the Capitol to strengthen a collective platform advocating for our united interests. RestoreHER founder Pamela Winn shared her harrowing experience being shackled while pregnant to illustrate the constant violence faced by incarcerated women. Ms. Winn’s powerful testimony inspired bipartisan support, and IMAN Atlanta organizers joined her advocacy for House Bill 345. The bill recently passed through the Georgia Senate and House of Representatives, and will prohibit the shackling of pregnant imprisoned women once it is signed into law. 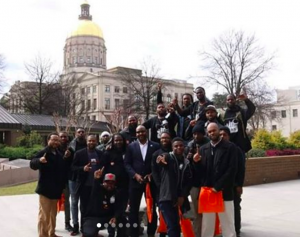 Just days after the horrendous attacks on the Muslim community in New Zealand, IMAN Atlanta returned to the Capitol for Muslim Advocacy Day to continue advocating for communities negatively impacted by inequitable legislation. Staff, leaders and Green ReEntry participants stood alongside community partners from Georgia Justice Project, CAIR Georgia, and Muslim Women’s Professional Network. Organizing Fellow Amirah Kahera spoke on the importance of maintaining unity in spite of adversity, and invited Muslim Advocacy Day participants to engage more deeply with IMAN’s larger #FightFearBuildPower efforts. IMAN Atlanta also recently hosted its annual Community Organizing Training, which introduced a diverse group of emerging leaders to our organizing principles and strategies. 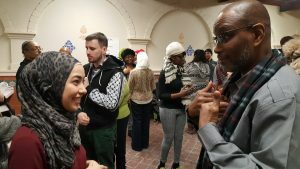 During this intensive two-day training, attendees reflected on the vital connections between intergenerational and interfaith leadership, and learned core skills needed to facilitate relational meetings. Those leading the training also drew connections between prophetic example and that of past civil rights leaders like Dr. Martin Luther King and Malcolm X to demonstrate effective coalition building. 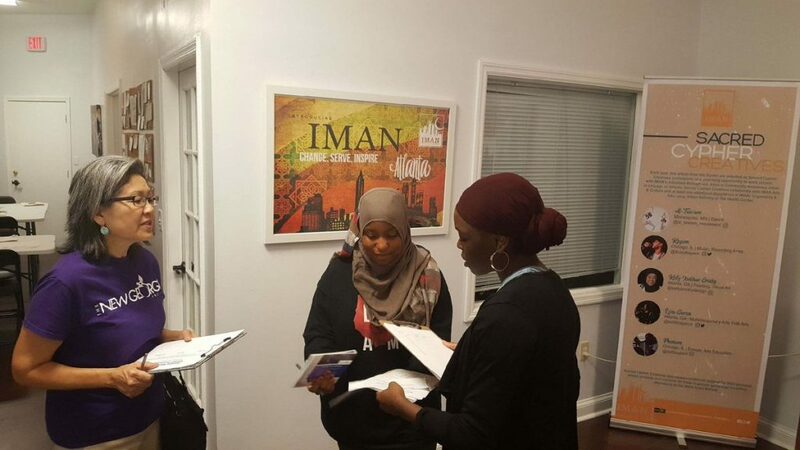 After completing the training, participants were invited to continue honing their community organizing skills at IMAN Atlanta’s weekly Grassroots Power Hours. 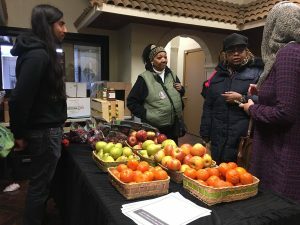 IMAN launched the new Fresh Market Stand initiative in early-March, adding another layer to our longstanding Food Ecosystems work in the Englewood and Chicago Lawn neighborhoods. Every Friday at 2 pm, visitors to IMAN’s Youth & Arts Wellness Center may purchase fresh fruits and vegetables, engage with health and wellness specialists, and receive helpful nutrition information. During the off-season of our weekly farmers market, the Fresh Market Stand will help meet the community need and demand for affordable fresh produce. In the first month alone, 420 lbs of produce were purchased at the Fresh Market Stand. The Fresh Market Stand plays a key role in IMAN’s larger vision of cultivating community wellness through increased access to nutritious food options. Reinforcing the cooperative, sustainable spirit of our Food Ecosystems efforts, the Fresh Market Stand is also an opportunity for Corner Store Campaign partners to buy produce in bulk. Using a cooperative buying model, five partner stores have purchased a total of 280 lbs of produce since March 2019. In addition to reducing waste, this unique business arrangement makes fresh fruits and vegetables even more accessible to local individuals and families. Our Fresh Market Stand will be open every Friday afternoon through the month of June. Another pillar of IMAN’s Food Ecosystems work–our weekly Farmers Market–will return on Friday, July 12th. 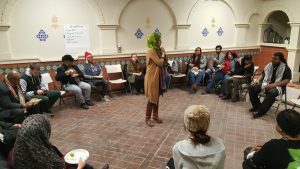 For additional information about IMAN’s food justice organizing, and to get involved with any of these exciting campaigns, please contact Food Ecosystems Coordinator Eric Rodriguez at eric@imancentral.org. Grassroots Power Hour, our weekly community forum has officially returned. Power Hour is a space open to neighborhood residents, youth, and others from across the city to build meaningful relationships and find shared values. These sessions will be held on Wednesday evenings in Chicago and on Thursday evenings in Atlanta. Our staff organizers facilitate these sessions, helping to build collective power and momentum to address issues that impact our families and communities, including police accountability, food access, and criminal justice reform. Power Hours in Chicago will focus on politics at the local level—as we gear up for the February 26th mayoral and aldermanic elections—and at the state and national levels, where we will engage freshman legislators to drive meaningful policy change. In preparation for Georgia Justice Day 2019, our Atlanta team will devote their first few Power Hours to analyzing key issues impacting the community, highlighting the importance of a unified voice, and creating a plan of action. In order to continue developing our deep network of organizers, both veteran and emerging leaders will be invited as featured facilitators each month. Dinner is also served every week just before the start of each session, giving attendees an opportunity to organically connect. Be sure to join us for Power Hour in Chicago on Wednesday evenings at 5:30pm, or in Atlanta on Thursdays at 6pm. Over the past few months, I’ve joined fellow IMAN organizers engaging with West Atlanta community members about the upcoming elections and encouraging them to vote. Through this, I learned about specific issues affecting the community and situated them in our nation’s sociopolitical context. These have been pivotal moments for me as a community organizer and graduate student of Public Health. While canvassing, I encountered West Atlanta families who have lived in the community for over 40 years, and youth who are enrolled in local colleges and universities. By connecting with these neighbors, I discovered that each of them plays a role in the community, making West Atlanta truly unique. On the college campuses, students shared with me their concerns about gun violence and public safety. Just last year, Georgia enacted a ‘campus carry’ law allowing students to bring secure and legal firearms onto campus for protection as a in response to recent campus shootings. Many students in Atlanta protested this legislation, wondering how more guns would make them any safer. Meanwhile, the elders shared concerns about displacement and gentrification in a community that is changing in many ways, especially commercially. Long-standing residents find themselves stuck in the middle of a sharp decline in affordable housing, and a clear increase in community redevelopment. I discovered a common thread linking the generations. The work of serving and uplifting the community must continue; the torch of leadership will be passed. But, how can we nurture that intergenerational collaboration if residents no longer feel secure in their homes and neighborhoods? The experiences of the past months have infused my GOTV efforts with a deeper meaning. I became more determined than ever to ensure that residents were registered to vote, despite the reports of mysterious voter purges in Georgia. The #FightFearBuildPower movement continues, and IMAN Atlanta is fully aligned with the West End and citywide communities around issues directly affecting us.